After being released on bail in December, both publicly denounced their severe physical and psychological abuse at the hands of security police and ministry of intelligence officials. The two were arrested again on January 20, one day after their alleged "confessions" to having conspired against national security were broadcast on state television, confessions which they have stated were obtained under duress. On January 24, the IUF wrote the Iranian government to demand their unconditional release and respect for the right of the Haft Tapeh workers to choose their workplace representatives free of management and government interference, reminding the regime that "If the Haft Tapeh workers have, over many years now, been compelled to hold strikes and protests to demand their wages and effective representation at the workplace, and if their struggle has attracted attention at home and abroad, it has nothing to do with political machinations in Iran or outside the country. It is entirely due to the fact that the workers and their families are chronically hungry and that management and the political authorities consistently violate their access to fundamental rights. Workers have, again, not received their wages in recent months and the many contract workers at Haft Tapeh suffer severe discrimination in the terms and conditions of their employment and chronic insecurity." The repression continues. 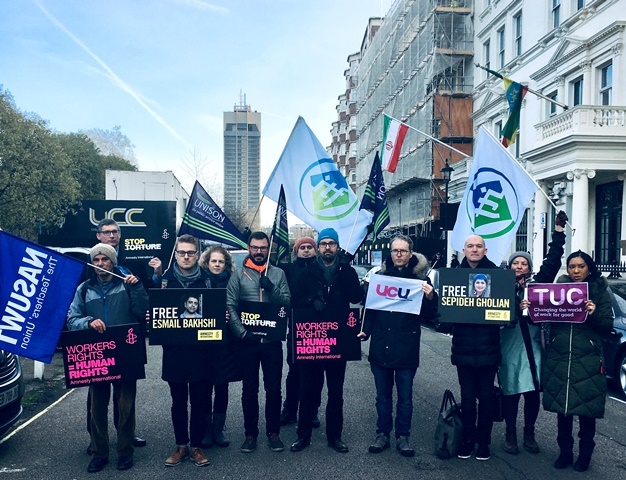 On January 29, long-time worker rights defenders Parvin Mohammadi and Jafar Azimzadeh of the Free Trade Union of Iranian Workers were arrested when security agents stormed their homes and confiscated their laptops and personal belongings. Mohammadi, a former metal worker, had published an open letter condemning the arrests of striking metal workers in Ahvaz demanding payment of wage and social security arrears. Azimzadeh has been repeatedly jailed and in 2016 conducted a 63-day hunger strike to gain release from a 6-year prison sentence for crimes against 'national security'.